Welcome, and thank you for visiting my website. I am a violin (and viola) teacher and performer in the Cedar Rapids, IA area. Have a look around and learn a little about me and some of the services I offer. You can check out the menu on the top or scroll down this page and click on the links or the pictures below for more information. Check out this video representing a few of my playing services. ​Mike received a Master of Music degree from the Cleveland Institute of Music. To find out more about his education and background, click ​here. 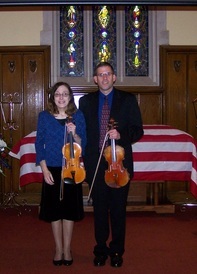 ​Mike is a violin and viola teacher in the Cedar Rapids, IA area. To learn more about lessons click here. Mike is an active Youtuber! His channel includes practice videos of Suzuki violin and viola repertoire as well as other performances. Check out the video on the right for a quick synopsis. To check out the channel go here. To learn more about the channel and any channel updates as well as find links to specific videos, check out the associated website here. ﻿Mike plays frequently for memorial services. For more information click here. ​Mike is a strolling violinist. For more information, click here. Mike plays music of the church, both alone and with his wife, Diane. Selections include old hymn arrangements as well as contemporary. For more information, click here. Want to hear more? Enjoy this video or find many recent and past performances on this site and youtube. Links to the right. For any questions or to check availability, contact Mike.